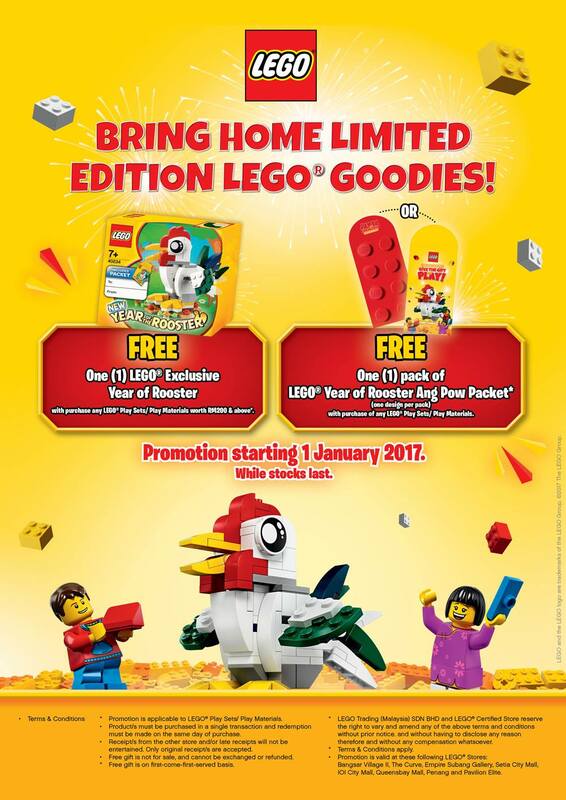 Chinese New Year is just a month away and we have the details for the exclusive Year of the Rooster LEGO set promo!! Free One (1) LEGO Exclusive Year of Rooster with purchase any LEGO Play Sets / Play Materials worth RM200 & above. Promotion is applicable to LEGO Play Sets / Play Materials. Products must be purchased in a single transaction and redemption must be made on the same day of purchase. Receipt/s from the other store and / or late receipts will not be entertained. Only original receipt/s are accepted. Free gift is not for sale and cannot be exchanged or refunded. Free gift is on first-come-first-served basis. LEGO trading (Malaysia) SDN BHD and LEGO Certified Store reserve the right to vary and amend any of the above terms and conditions without prior notice and without having to disclose any reason, therefore and without any compensation whatsoever.